We are staying at Scott’s parents for almost two weeks this holiday. They live in Oregon, up in the mountains. It’s such a welcome break from DC. There are wide, snow-covered fields where cattle and horses nonchalantly snuff at the ground, the air is dry and still, and some days, all I can hear is the wind in the pine trees and the snow as it falls from the branches. I have been running almost every day even though at almost 5000 feet, I am out of breath almost as soon as I start. In some ways the trip has been stressful for me. I am much like my oldest son. I love routines and out of my own cozy nest, I feel a bit not myself. I realize how tied I am to place, how quick I am to put down roots, to fill my refrigerator with familiar food and hang pictures on the walls, to get to know the running routes. And yet, being away has been good too. If it has gotten me out of my comfort zone, it has also gotten me out of my own head and out of my own way. To my surprise, my husband bent down and let Gus pet the bird. Five-year old Oliver lifted his head briefly and went back to his Legos. But Gus was mesmerized. He stroked the bird’s feathers and his eyes were wide with wonder. 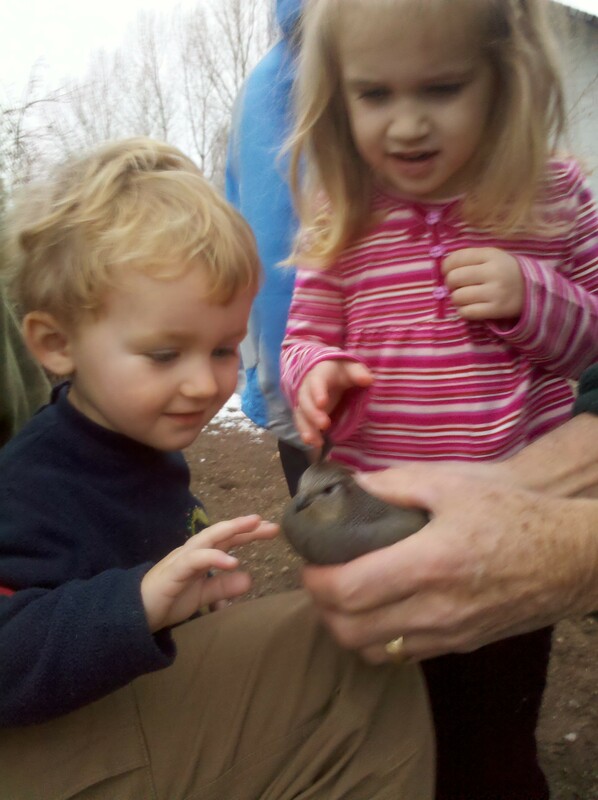 “Want to hold the bird daddy,” Gus said. “We have to let him go Gus. He has to go home,” Scott told him. I watched the bird who was so calm in my husband’s hands. I would have been freaking out if I was the dove, but there he was, the very symbol of peace, a spot of irridescent purple under his eye. “Want to hold the bird daddy,” Gus kept saying and skipped next to my husband even as he walked out onto the snow-covered deck into the cold morning air. Gus doesn’t like the cold, but there he was, waiting for my husband to place the bird in his hands. Although a lot of things happened this Christmas, the memory of that morning is tops for me. Gus stood with his feet wide apart in his red footie pajamas, his eyes on the sky and the bird clutched close to his chest as if it had been just been within his own heart, inside his own cage of bone rather than trapped behind a fence of wire. And then, without warning, Gus opened his hands and stepped back as the dove beat its wings, scrambling for purchase on Gus’ fingers and creating momentum. There was a moment of furious wing beats and then silence. The bird took flight and we all watched it go. This metaphor was not lost on me, how tightly I hold onto my boys and how I need to let them go. Oliver is now five and craving independence. For the first time, he is in a school that does not welcome parents in the classroom. I feel powerless most days, not knowing what is happening for the three hours when he is out of my care. When I ask about school: about the golden walnuts or the crown of yarn or the games he plays, he tells me that it’s a secret. For a while I wanted to take him out of school. It seemed too unstructured, too rough sometimes. My son needed to feel safe. He needed to be with me for just one more year.But while I was struggling with what to do and with making a decision, Oliver figured things out for himself. He made friends. He made bread and was proud to help knead it. He learned to fold the pillowcases and later to stuff them with pillows for rest time. He told me that he liked his school. While I struggled and worried, Oliver got on with the business of living his own life. Lately, I have been reading some great posts about parenting from Bruce at Privilege of Parenting and Kristen at Motherese. They both talk about true attachment parenting and about how “attachment” does not mean “clinging.” Bruce wrote a wonderful peace about how we must know our children and keep our own issues separate from theirs, how we need to raise them as they ask to be raised by teaching them what they need to know and by honoring their unique gifts. Kristen wrote about several books that are out now. One spoke about our common fantasy of creating perfect environments for our children. How our generation of mothers share a belief that if we eliminate impurities from our kids’ diets and close their eyes and ears off to violence and buy just the right toys, our children will be perfect. And we in turn will look like perfect parents. That rang so true to me. I have read dozens of parenting books. I have the entire Dr. Sears library on my bookshelves. I want to create a bubble for my boys and prevent anyone hurtful from entering. I don’t want them to hear a mean word or be on the receiving end of a cruel act. This in itself is not bad of course. Of course it makes sense to keep media to a minimum and to shield children from as much evil as we can. But it’s a short distance from doing our best to trying to control our children. It’s a fine line between keeping our children safe while they are in the nest, to hindering their flight. It’s a very slippery slope from trying to be a good parent to trying to look like a good parent. I am a good candidate for a helicopter parent. I love to hover. I believe that if I worry about something enough, it won’t happen. I subscribe to a cheap religion of bargaining instead of praying, of tithing anxiety in exchange for best outcomes. This of course does not lead to happy children or secure children or peaceful children. This dove today taught me that. Gus taught me that. He showed me that I need to hold my little birds close when they need me, to snuggle their softness and revel in the way their hearts beat like crazy to get out. But I need to let go too. I need to let them fly, in small doses now, but in increasingly longer intervals. After all, that is my job. I am only here to prepare them for their own journey home, for their own precarious flights. How you have captured the essence of parenting. As a 68 year old I still want to hold onto the dove and put a string on his ever so thin tiny leg but the dove moves too fast. You are a beautiful writer and hope you will publish this piece for others to read, enjoy, touch memories, and smile. Oh, I am crying … “I am only here to prepare them for their own journey home, for their own precarious flights.” How true, how beautiful, how hard, how … well, everything. This is such a wonderful piece, Pamela, and one that resonates with me on a very deep level: my older son’s name means dove and I often think of him as my own sweet, little dove. So what a powerful experience to read your essay and to think of him not only as the dove (surprisingly trusting, but needing to soar on his own), but also as your Gus (wide-eyed, loving, risk-taking). I will carry your lovely words with me today. Thank you. You are currently reading Peace at Walking on My Hands.